I think these little envelopes are just so charming. They would be so cute to have around to put an “i love you” note in or to put some money in and give it to your daughter in college…. there are many possibilities. you get 50 for $8 and can customize what they say. 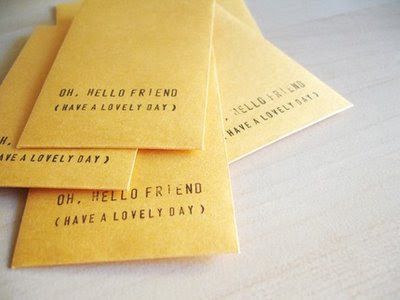 i kind of like the hello friend, have a lovely day. but it’s nice to have options. oh and the cool girl who designs them has a pretty blog too. it’s called. oh, hello friend.